Many of our friends are hugely into meditation and can’t speak highly enough about the amazing benefits it’s brought to their life. We thought it was finally time for us to find out what all the hype was about. This is an extremely raw, open and honest poddy where we tell you our stories and opinions on all things relationships and influences. Today we chat to him about all things diet, morning routine, training and his experience with trying to maintain the leanest physique of his life... is it possible to live like that forever!? "The first Poddy nugget!" In this episode the dynamic duo (Sarah and Kurt) part ways for the first poddy nugget. Kurt discusses the tough decision involved in finding your dream job. Discussing his past experiences on his journey to becoming a content creator. This week we decided to reflect on our most 'shredded' self and share our top 10 tips to get defined abs! We're talking exercises, diet, lifestyle factors and key workouts to give you the best abs of your life! Sharing personal stories, workout routines and diet tips, we're here to spill the beans on all things 6 pack... or 8 pack if your Kurtimous haha! Our Relationship, Flings, Rebounds, Breakups And Playas! It&apos;s Story Time! We're talking all things luurrrvvvv, relationships and the infamous summer fling! We open up about our own relationship including first impressions of one another, reservations and taking the next steps. We also dive into some hilarious stories involving our summer flings and rebounds from past relationships. Episode seven is basically one huge... story time. Oh and... Kurt exposes Sezzy, embarrassing her like she' never has been before! THE SECRET LIFE OF YOUTUBE - Sarah&apos;s Day Tells All! It has been a busy period at Health Code HQ. This episode is a little shorter than the usual, but is jam pack with tips and tricks around cravings, cheat meals and alcohol. Get your headphones ready as we are about to spill some serious tips! What a CRAZY week! This topic couldn't come at a better time for us, the relevance was REAL! Balancing health, fitness, relationships, social life, work, study and everything in between can be a struggle. We're hear to share our opinions, tips and thoughts when it comes to balancing a busy life! Oh and prepare yourself for some INSANE, life changing news from us!! We're here to reveal our favourite healthy hacks and tips we couldn't live without! Including health, fitness, career and lifestyle, we decided to open up about some unconventional and simple healthy habits we've integrated into our lives. Have you ever wanted to jump inside a guys brain for a day!? Well... this is your chance! Quizzing Kurt on all things dating in our new segment 'Kurts Dating Diaries'. We're not sure what was in the air this week or how the stars were aligning, but Sarah was on a SERIOUS power trip. This week we see the usual soft, sweet and sensitive Kurt, turn on Sarah and reveal her most embarrassing moment! Here's a clue... rogue poop. In episode two we discuss one of the toughest fitness questions 'Are You Training Hard Enough!?' How hard SHOULD you be training to reach your goals and... how do you determine if you're training at your peak!? To top it off, who doesn't love a good old Q&A? We shout out some of our favourite Instagram questions, open up and share some juicy goss with you! Yep, we're talking marriage, babies, poop and cheat meals! Let's kick things off by discussing WHAT IS The Health Code! Episode one dives straight into what to expect from this podcast, including their secret 'code book' collection! Sarah and Kurt open up about their lives, backgrounds and history with health and fitness, while letting us in on their epic project comeback. 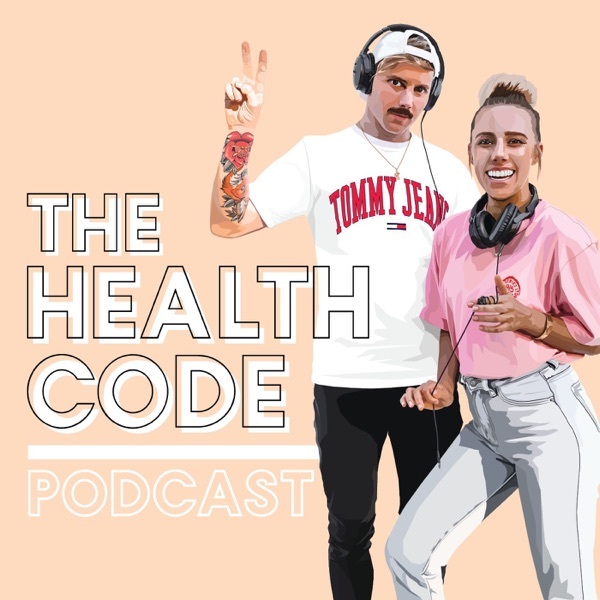 Couple banter, back on tracks tips and some sneaky life stories, it's time to jump in to the very first The Health Code episode!